It's the 5th day of giveaway! So answer the simple question below and stand a chance to win one Rimmel Shock Gloss from me! Answer this Q : What combination ingredients extract found in Rimmel Shock Gloss that help lips feel moisturized and conditioned? And the winner will be chosen using http://random.org. And prizes will be only sent out after the giveaway ends. There will be ONE Rimmel Shock Gloss worth RM23.90 to be given out each day starting 24 December 2010 until 2nd Jan 2011 (for 10 days in total)! So do come back daily!!! 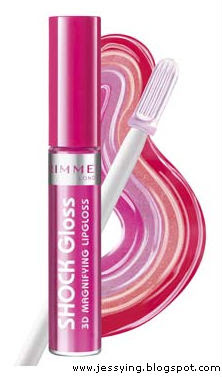 Read my review of the Rimmel Shock Gloss here to find the answer! 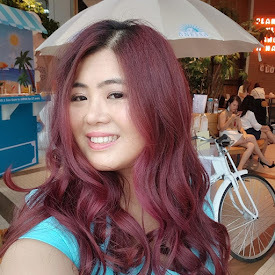 Don't forget to join Rimmel's facebook fans to get more updates and promotion!!! p/s: Please be reminded that entry comment that joined after the above stated timeframe will not be published. Answer :The gloss is made from combination of ginseng extract, grape seed oil and Shea butter which help lips feel moisturized and conditioned. Answer: Ginseng extract, grape seed oil and Shea butter. Answer : Ginsend extract, grape seed oil and shea butter. Answer : Ginseng extract ,grape seed oil and Shea Butter.